The two human medically important species of Proteus species Proteus mirabilis and Proteus vulgaris. Closely related species of the genus Proteus were assigned earlier also, are Morganella morganii, Providencia rettgeri and Providencia stuartii. The genus Proteus belongs to the family Enterobacteriaceae. Proteus strains are highly flagellated and thus very flexible. On solid culture media can "swarm", which distinguishes it from other Enterobacteriaceae species. They carry pili (fimbriae) and are not bekapselt. The differentiation of species is due to the metabolic activities. Indole is metabolized by Proteus vulgaris, but not by Proteus mirabilis. In both species a number of antigens has been described. Proteus are a natural part of the intestinal flora of healthy individuals. In addition, they are found as rot pathogens in soil and water. The diseases caused by them are mostly urinary tract infections, rare systemic infections such as sepsis, endocarditis or meningitis. Proteus mirabilis isolated far more common than Proteus vulgaris. The proportion of Proteus mirabilis in acute uncomplicated urinary tract infections can be up to 10%. In hospitals rarely find multiresistant strains. 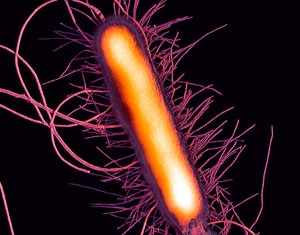 Proteus vulgaris is primarily a cause of nosocomial infections. Urinary tract infections, the ability of Proteus strains to Ureasebildung seems to play a role. Urease splits urea into carbon dioxide and ammonia. This leads to an alkalinization of urine and subsequently to a partial destruction of tubular epithelial cells, thereby allowing bacteria to enter the renal parenchyma and can cause tissue damage. Proteus vulgaris is considered a typical secondary infection agents in necrosis. The microbiological diagnostics are done with the cultivation of appropriate study materials and the biochemical identification. Proteus vulgaris strains are due to Betalaktamasebildung inherently resistant to many beta-lactam antibiotics [eg. As ampicillin (BINOTAL etc. ), cefuroxime (CEFUROXIME etc.)]. Part of the tribes is also resistant to cephalosporins group 3. The beta-lactamases are inhibited by beta-lactamase inhibitors. Proteus mirabilis, according to the study of resistance Paul Ehrlich Society for Chemotherapy 26% of the strains to ampicillin and cotrimoxazole (COTRIM etc.) and 7-8% to cefuroxime or fluoroquinolone resistant. The agent of choice for the treatment of acute uncomplicated cystitis calculated to be co-trimoxazole, fosfomycin trometamol (Monuril etc. ), Pivmecillinam (SELEXID only in Austria) and nitrofurantoin (Furadantin, etc.) and acute uncomplicated pyelonephritis for ciprofloxacin (Cipro, etc.) or levofloxacin (Tavanic etc.) is recommended. The treatment of complicated urinary tract infections should take place according to the results of susceptibility testing. Multidrug-resistant strains are almost always to carbapenems [ertapenem (ertapenem sodium), imipenem (ZIENAM etc. ), meropenem (MERONEM)] sensitive. Cefamandole Intramuscular, intravenous. 0,5-1 g (max daily dose - 12 g) 3-6 times a day for 10-14 days. Cefpodoxime 100 - 200 mgs twice a day for 10-14 days.